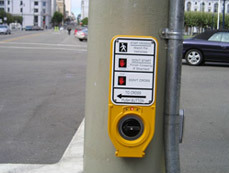 means, for the purpose of this Agreement, a Pushbutton-Integrated device that communicates information about Pedestrian Timing in a non-visual manner, such as audible tones, speech messages, and vibrating surfaces, and has the following features to the extent that they are available from an APS vendor: (1) a Pushbutton Locator Tone; (2) a pushbutton actuation tone and light in response to the button push to indicate that the button has been pressed; (3) an Audible Walk Indication; (4) a Vibrotactile Walk Indication; (5) automatic volume adjustment in response to ambient sound; (6) a tactile arrow; (7) a Pushbutton Information Message; (8) street name in Braille and Large Print; and (9) a Pushbutton with a 2″ minimum diameter. means the use of a permanently fixed sound source to provide directional orientation and crossing alignment information to pedestrians with visual impairments or blindness. means the vertical surface on which the pushbutton is located. means a location with one or more pedestrian crosswalks, including mid-block crossings, and with one or more Visual Pedestrian Signals associated with the crosswalks. means the portion of the Pedestrian Timing during which the flashing upraised hand, symbolizing “Don’t Walk,” is displayed, signaling that pedestrians should finish crossing the street. means the cycle of the time allotted in the signal cycle to allow a pedestrian to cross the street. Pedestrian Timing consists of: (i) the Walk Interval and (ii) the Pedestrian Change Interval. means the information delivered audibly when the pushbutton is pressed and held for one second or more during the flashing or steady “Don’t Walk” indicator. The Pushbutton Information Message shall follow the model “Wait to cross [Street name] at [cross street name].” Information on unusual intersection signalization or geometry may be provided following the crosswalk identification message. No other types of information may be provided. means an Accessible Pedestrian Signal in which all audible and vibrotactile information is provided from the pushbutton housing. The Pushbutton-Integrated APS may also activate an overhead speaker where Audible Beaconing is provided, as set forth in section 2.6 below. means a repeating sound that informs approaching pedestrians of the APS. Pushbutton Locator Tones shall be easily locatable, shall have duration of 0.15 seconds or less, and shall repeat at one-second intervals while the visual flashing and steady “Don’t Walk” message appears on the Visual Pedestrian Signal. means a ticking sound that repeats at the rate of ten ticks per second. means a tactile arrow that contrasts with the background, is oriented in the direction of travel on the associated crosswalk, and vibrates throughout the Walk Interval, indicating that the Walk Interval is on. means a signal that provides information about Pedestrian Timing in a visual manner. means a method of informing the pedestrian that the Walk Interval has begun. means the portion of the Pedestrian Timing during which the walking person, symbolizing “Walk,” is displayed, signaling that pedestrians are permitted to start to cross the street. 2. Installation and Operational Requirements. Walk Indication and Pushbutton Information Message. 2.1.1. When Pushbutton-Integrated APS serving separate crosswalks are installed on two separate poles on a single street corner or other locations with pedestrian crosswalks separated by at least 10 feet at the same crossing, the Audible Walk Indication shall be a Rapid Tick. 2.1.2. When Pushbutton-Integrated APS serving separate crosswalks are installed on the same pole, the Audible Walk Indication shall be a Speech Message. 2.1.3. Where the Visual Pedestrian Signal is a fixed time signal (i.e., does not require pedestrian activation), the Accessible Pedestrian Signal shall also be a fixed timed signal. 2.1.4. Except as provided in sections 2.1.5 and 2.1.6 herein, the Audible and Vibrotactile Walk Indications shall be repeated for the entire duration of the Walk Interval. 2.1.5. This paragraph applies only to a situation in which a pedestrian signal (i) is used to assist pedestrians crossing a minor street that intersects a major street; (ii) stays in a rest-in-walk status; and (iii) only changes to “Don’t Walk” when a pedestrian pushes the button to cross the major street, or a vehicle activates the signal to cross the major street. In such situations, and where technology provided by the City’s APS vendors provide the option, when the duration of the rest-in-walk status is longer than 7 seconds, the Audible Walk Indication will terminate after 7 seconds but the Vibrotactile Walk Indication will stay on throughout the rest-in-walk status. 2.1.6. Alternatively, if technology provided by the City’s APS vendors permits, when the duration of the rest-in-walk status is longer than 7 seconds, the Audible and Vibrotactile Walk Indications will terminate after 7 seconds. These non-visual Walk Indications will be re-activated during the rest-in-walk status whenever a pedestrian pushes the button to cross the minor street and there is sufficient time remaining in the pedestrian phase for the Pedestrian Change Interval. 2.2.1. The Pushbutton Locator Tone and Walk Indication emitting from the Pushbutton Housing shall be audible, under varying conditions of ambient sound, 6 feet to 12 feet from the pushbutton, or to the building line of the nearest building, whichever is less. When the pushbutton is pressed and held for one second or more during the flashing or steady “Don’t Walk” phase, the volume of the Walk Indicator and Locator Tone will be increased for a maximum of two cycles. Under such circumstances, the volume of the Locator Tone shall be increased during the Pedestrian Change Interval only. 2.2.2. Volume shall be increased for one, or if available from the vendor, two Pedestrian Timing cycles following a button press of one second or more. 2.3. APS Control Surface and Pole Placement. 2.3.1. Where two or more APS serving two or more crosswalks are installed on a single street corner or other pedestrian crossing location, they shall be installed such that the APS Control Surfaces and associated speakers are separated by a horizontal distance of at least 10 feet unless it is structurally impracticable or technically infeasible to do so. If the City believes that the APS Control Surfaces and associated speakers cannot be placed ten feet apart because of structural impracticability or technical infeasibility, it shall provide Claimants with the factual basis for the City’s position in writing, including the identity of the intersection where the poles are located. The City shall also inform Claimants whether the APS will be installed on a single pole or on two poles separated by less than 10 feet (and, if the latter, the distance between the two APS Control Surfaces and the distance between the associated speakers). The City shall also inform Claimants of the means by which it will ensure that these APS provide unambiguous information regarding which crosswalk is in the Walk Interval, including the Speech Message(s) to be used, if any. The APS pushbutton shall be located approximately 42 inches above the adjacent walking surface. 2.4. Number of Accessible Pedestrian Signals Per Intersection. If one crosswalk at an Intersection is to be equipped with an Accessible Pedestrian Signal, each crosswalk in that intersection that has a Visual Pedestrian Signal shall be equipped with Accessible Pedestrian Signals for each Visual Pedestrian Signal associated with the crosswalk. 2.4.1. Where transit stops are located along a median or traffic island, Pushbutton Integrated APS shall be installed in the median or traffic island where an existing pedestrian pushbutton is installed. 2.5. Hours of Operation of Accessible Pedestrian Signals. 2.5.1. If the City receives complaints from the community regarding noise levels emitting from an Accessible Pedestrian Signal at night, the City shall evaluate the APS and make any required adjustments to ensure the APS’ volume setting complies with Section 2.2, above. If complaints continue after such adjustments are made, and the signal is a fixed-time signal, the City may elect to change the signal to a pedestrian actuated signal. On reasonable request from Claimants, the City shall inform Claimants of any Intersections that have been the subject of noise complaints. 2.5.2. The APS shall be deactivated when the associated vehicular signal is in flashing mode. The parties recognize that some, but not all Intersections may be appropriate for Audible Beaconing. The City will consider the use of Audible Beaconing when the function is included in commercially available APS equipment. Raised characters, text, symbols, pictorial symbol signs and Braille where provided shall conform to the requirements of the California Building Code, Section 1117B.5.2, 1117B.5.3, 1117B.5.4, 1117B.5.5, 1117B.5.6,. Color coded textured horizontal bands shall be provided in accordance with 1117B.5.9. This document is the Settlement Agreement about Accessible Pedestrian Signals with San Francisco. These signals, also called APS, make a sound when the walk sign is on. The signals also vibrate when the walk sign is on. This agreement was the first of its kind in the United States. The City agreed to spend at least 1.6 million dollars and install APS. At least 80 intersections will have APS. No lawsuit was filed. Instead, Structured Negotiations were used. Lainey Feingold and Linda Dardarian were the lawyers. The California Council of the Blind, the San Francisco based LightHouse for the Blind and Visually Impaired, the Independent Living Resource Center San Francisco, and blind advocate Damien Pickering helped to negotiate the Agreement. One part of the agreement are detailed requirements about APS. There is also a detailed document to help other cities decide where to put APS.